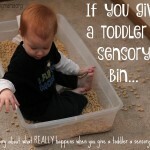 Do you have a toddler who loves to pull things out? For example, maybe all the wipes out of the container? 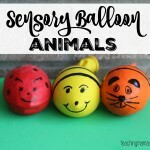 If so, this activity is perfect for your little one! The best part is that it’s basically free. 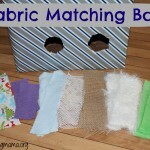 All you need is an empty wipes container and fabric or ribbon scraps. 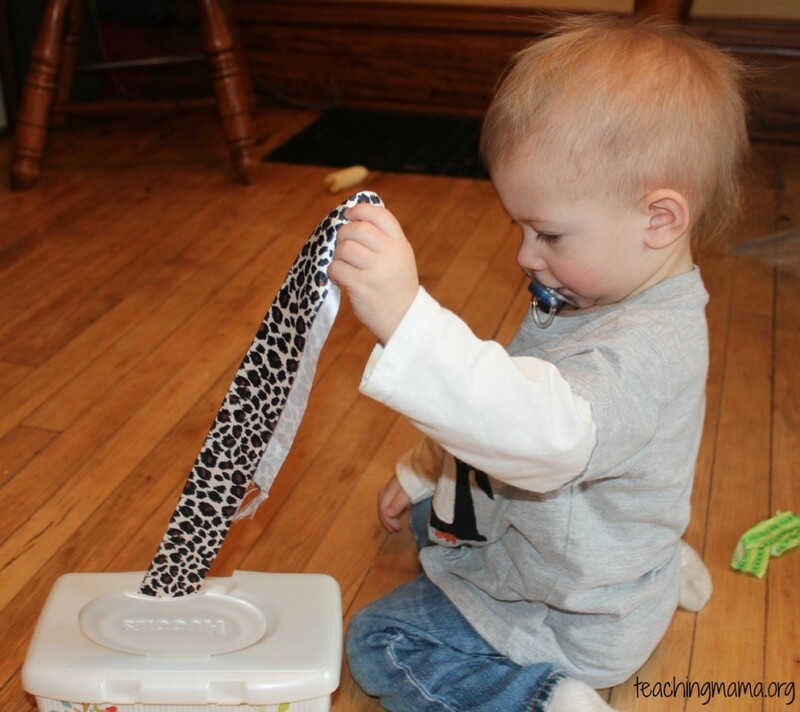 The goal of the activity is to have your toddler put the fabric scraps in the wipes container and then pull them back out. 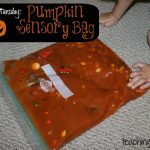 It helps them work on fine motor skills, but also is a sensory activity with the different textures of fabric. I’m sure if you wanted to spend more time on this you could sew the scraps together to make one long chain or even tie them together, but I chose the easy route. 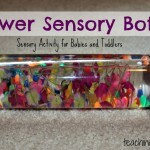 What I love about this activity is that it is basically a free toy to keep your toddler entertained. 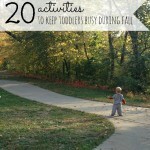 And we all know that toddlers love keeping busy! Thank you for toddler Tuesday! I need these ideas badly! Oh I’m so glad to hear that!! I am happy I decided to start doing this. 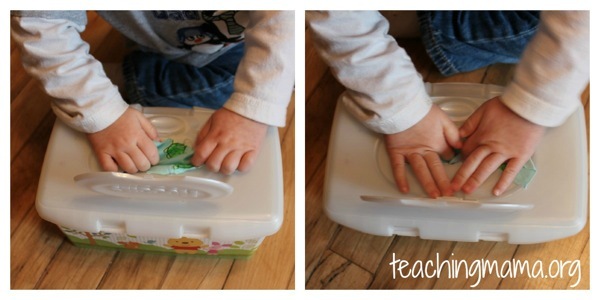 It’s easy to focus on preschool activities with my oldest, but it’s fun to come up with toddler activities, too! Hope you are doing well!! Yes, this will be good to occupy her during school!! Hope it works out well for you! My son is a little old for this one, but it made me smile remembering these sorts of activities. I’m thinking he might enjoy a collection of fabric scraps to use as loose parts for pretend play, though, so thanks for that idea! Ohh so fun! You are welcome. Thanks for your comment! My mom brought a bunch of fabric scraps with her this weekend so I’m going to make this for Lucan! Thanks for this idea. 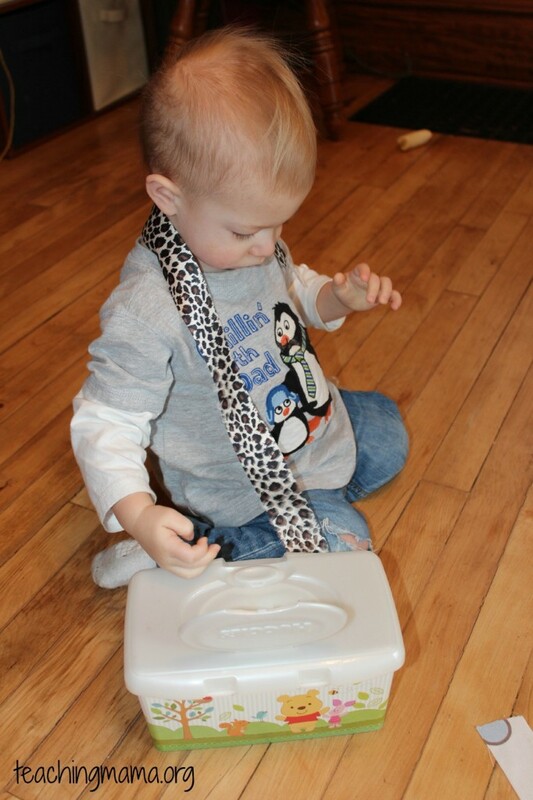 My son does like pulling wipes out of the box. I will use some of his old clothes I was going to donate to make the fabric scraps….or I have a bunch of head scarves in my drawer that I can use. Thanks for this one! Really. I know this post’s a couple years old but I still wanted to leave a comment! 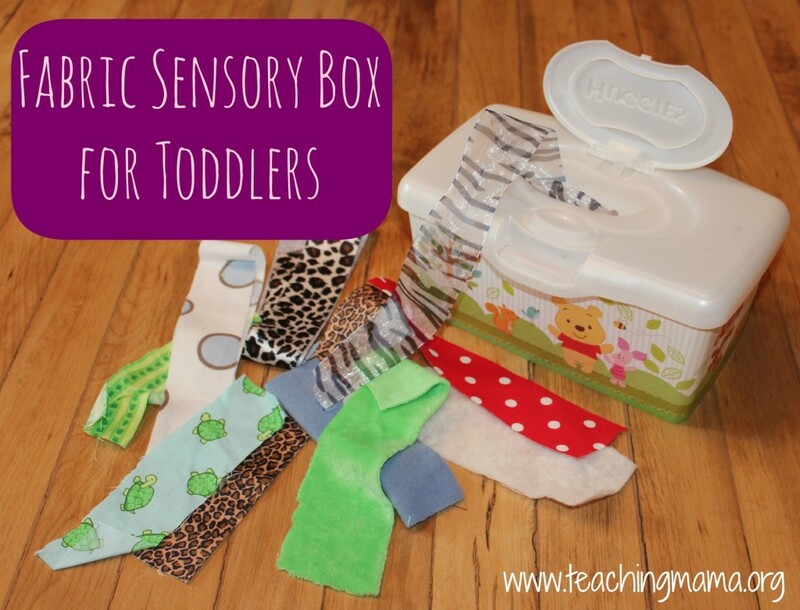 I have a 13-month-old and he loves our Tupperware cupboard more than anything in his toy box, so I started searching pinterest for some easy DIY toddler activities and this one is PERFECT! He’s definitely at the stage where taking things out of their box and putting them back in is his main goal in life and he’s always taking wipes out for me. I’m not a naturally crafty person so some of the ideas I saw on Pinterest were a bit nerve-wracking for my first toy project. Saw this, and as soon as my LO when to bed for the night I got out my box of fabric scraps and a cute Frozen-themed wipes container we’d just finished and in less than 10 minutes his fabric box was complete! And oh my gosh – he LOVED it! The different colors and patterns, as well as textures, shapes, sizes… plus the fact that I was actually letting him take them all out of the wipes container instead of quickly taking the container away… he played forever and laughed out loud several times because he was just so happy. I think this will be a favorite for many more days. And now I feel confident enough to tackle some more intense DIY projects for him. So, thank you!!! PS – I’m a former teacher as well (Taught 3 years of Public School SPED, degree in SpEd and Gen Ed) and I am loving your entire blog!!! I’m really embracing being my child’s first teacher and teaching pre-school at home so your blog has been an amazing resource. I’m also contemplating homeschooling past the pre-school years for a lot of reasons – we live in Arizona, where our public education system just horrible. We’re already the 48th state for student achievement and our Governor just slashed the education budget so badly that our district is cutting out full-day Kinder, class sizes are already at 30 kids and they’re now going to be up to 35, and quality teachers are few and far between… I put my heart into teaching in the public schools here but even then I was not able to give those kids the education they deserve, and sadly, quality teachers that really care just don’t stay long around here. I know I could give our son the quality education he deserves, not because I don’t value public school teachers (I was one! You know how hard we work!) but because public schools here in particular just don’t have the resources for even the best teacher to truly educate her students. 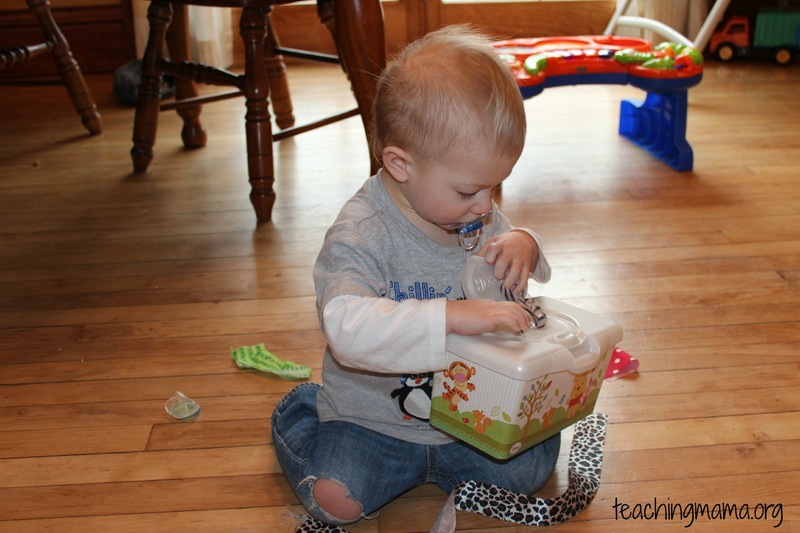 I’m an educator and a SAHM, who better to personalize instruction for my child than me right? But my husband is vehemently against this! He agrees that I would be a great teacher for our son and it would be better for him educationally but he doesn’t understand how bad the public school situation is, he thinks our baby would still be able to excel in public schools… but what he has a problem with is the social aspect, he feels our son should be socializing with other kids when he’s school-aged. And I just don’t know what to do about that issue either. Obviously we have time to figure it out but we’re not religious and the only advice I’ve been able to find online centers around church groups and that wouldn’t work for us… I know this is an old post and totally off topic and I’m not expecting advice, just needed to get this out and if anyone happens to read and has some advice I wouldn’t mind that! Ok well, thank you again! Hi Amy! Thank you so much for your very kind words…they are very much appreciated! 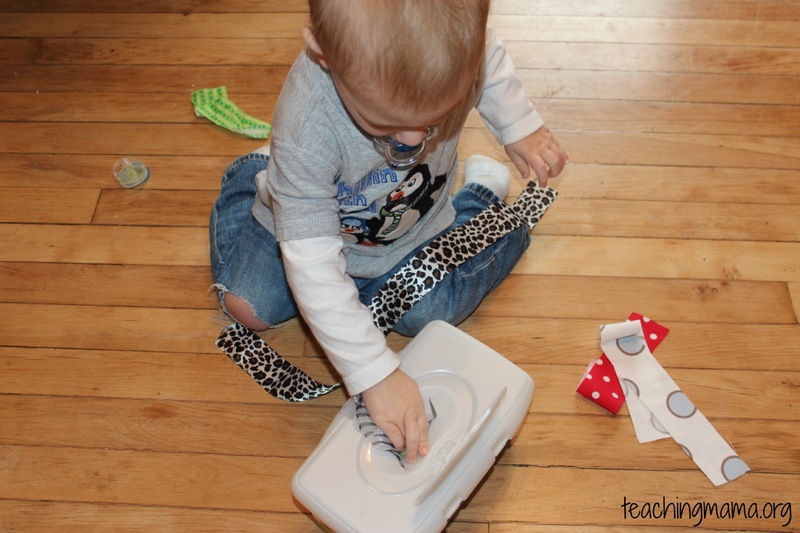 So happy to hear this DIY toy was a success! It’s so fun to meet and connect with people through blogging. I love that you value education for your child and want to be his first teacher. It’s tough to decide what to when it comes to sending kids to school….especially if your husband is against it! It’s also hard when you have a teaching background and know that you have the skills to teach your own child. I hope you will find a solution!!! Blessings to you, Amy!